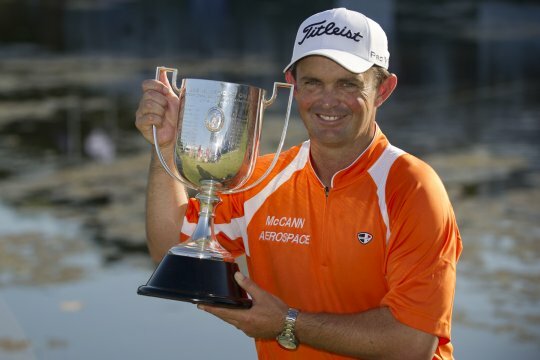 Greg Chalmers has won the 2011 Australian PGA Championship in a sudden-death three-way playoff at Coolum. In one of the most dramatic finishes in the tournament’s history, Chalmers, four-time winner Robert Allenby and Marcus Fraser all finished tied on 12-under-par. Chalmers ended a day of high drama to win the Kirkwood Cup with a regulation par at the first playoff hole after Fraser drowned his drive and Allenby missed his par putt from four metres after a wayward tee shot. Allenby went into the play-off with a 3-1 record and with the momentum after draining a a six-metre birdie into the hole on the 18th to get to 12-under. Earlier Allenby missed makeble birdie putts at the 16th & 17th and would undoubtedly feel he let this championship title slip. Chalmers, who won the Australian Open at The Lakes two weeks ago, is topping off an impressive Australian summer. Chalmers is on track to complete Australian golf’s triple crown at next month’s Masters at the Victoria Golf Club, a feat that has only been achieved by his playoff partner, Robert Allenby.